Here’s a question that’s going to become more and more relevant over the next decade: How do you manage employees when you’re working with a remote team? When I started SalesFolk, one of the first things I made sure to do was create definite ideas around how employees would communicate and collaborate remotely, whether with me or one another, in groups or one on one. Today, we have over 40 people working for the company, all of them completely comfortable with a culture that’s built on remote collaboration to get work done. As more work moves online and more companies rely on a geographically distributed teams, managing remote work should be a priority, especially if your goal is to one day be a manager or executive. So with that in mind, check out our latest video, which explores four things you can do to effectively manage remote teams. 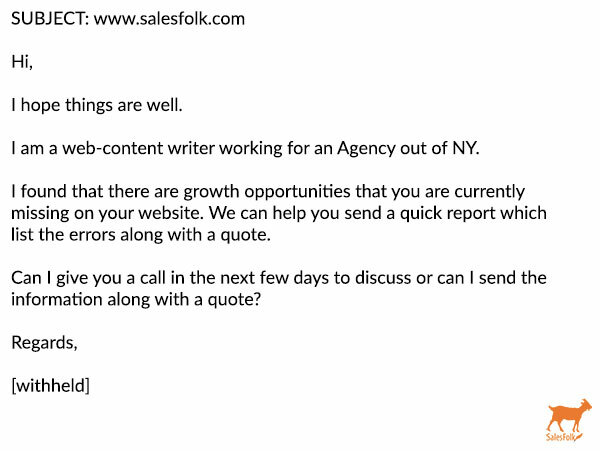 We get tons of cold emails over here at SalesFolk, but they’re not all created equal in terms of quality. For every enticing message that lays out clear benefits and asks helpful questions, there are 10 that commit email crimes like laziness, being too self-focused, or asking us to do all the work. 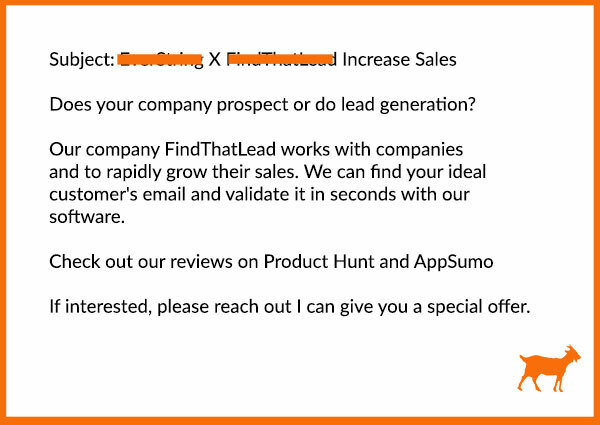 While it would be nice to never get emails like these at all, they do offer some great real-world lessons for salespeople, marketers, and anyone interested in attracting customers over email. Imitation is not always flattery. 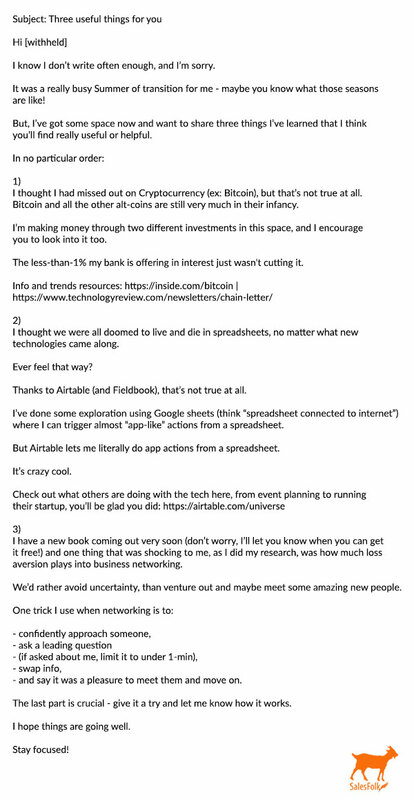 This person uses one of Heather’s old cold email templates from a few years back, but completely butchers it. 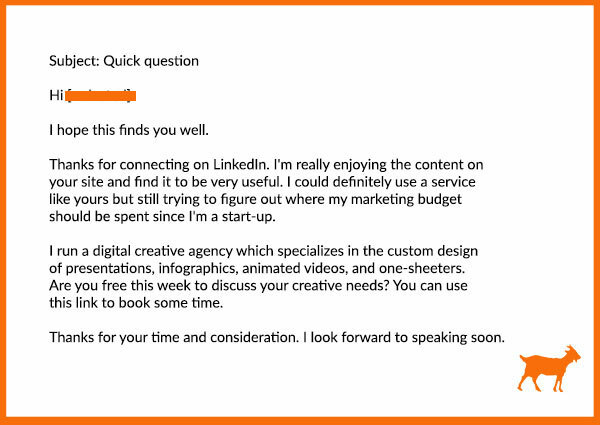 “Quick question” is way overused as a subject line now, and it’s also misleading, since the message that follows is anything but quick. 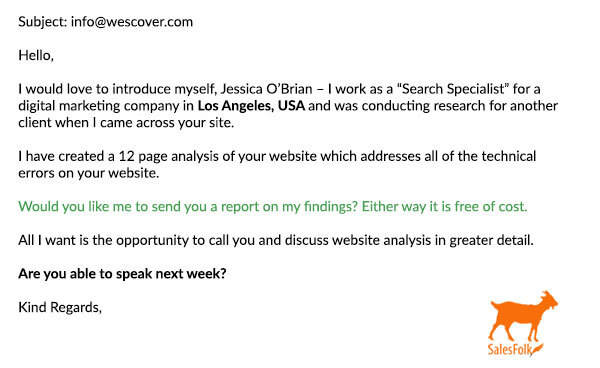 And speaking of flattery: this person needs a lesson in how to make it sound convincing. The opening pleasantry screams of false concern. 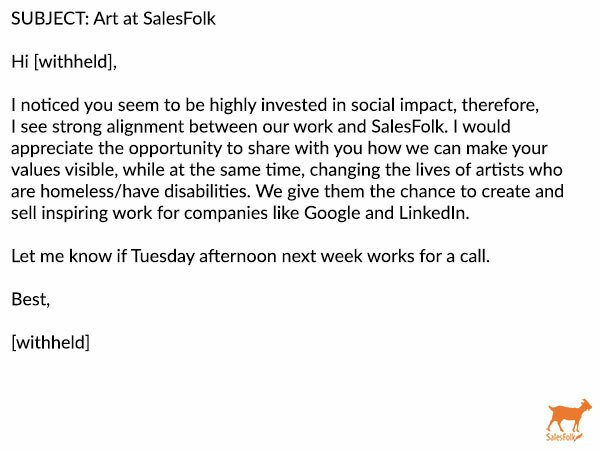 The paragraph that follows it is nothing more than a thinly disguised setup for the sender’s real intentions, which is to talk about their creative agency. 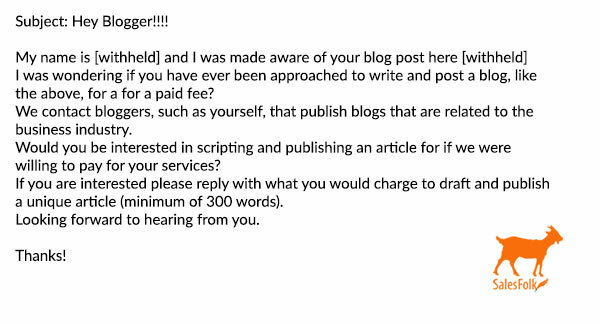 If given the choice, I would rather someone drop me three lines of text asking outright if I need creative services, rather than assume I’m not smart enough to see through fake niceties. 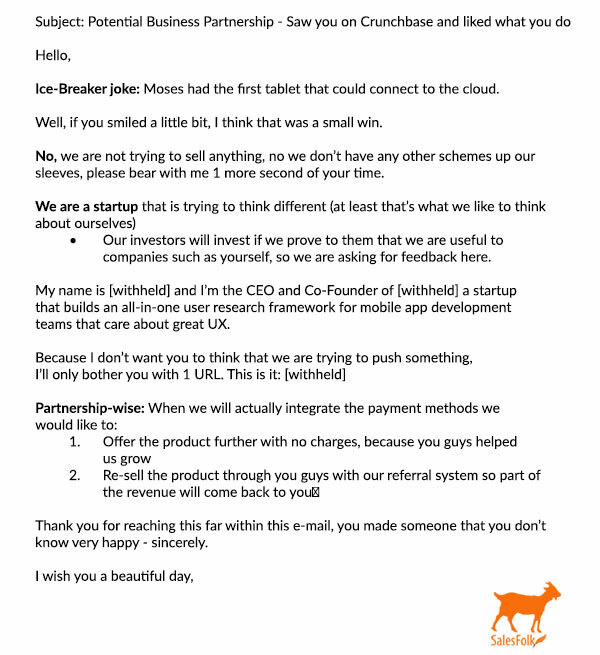 Occasionally, we get excited about a cold email and include too many asks in one message. This email goes to new extremes. 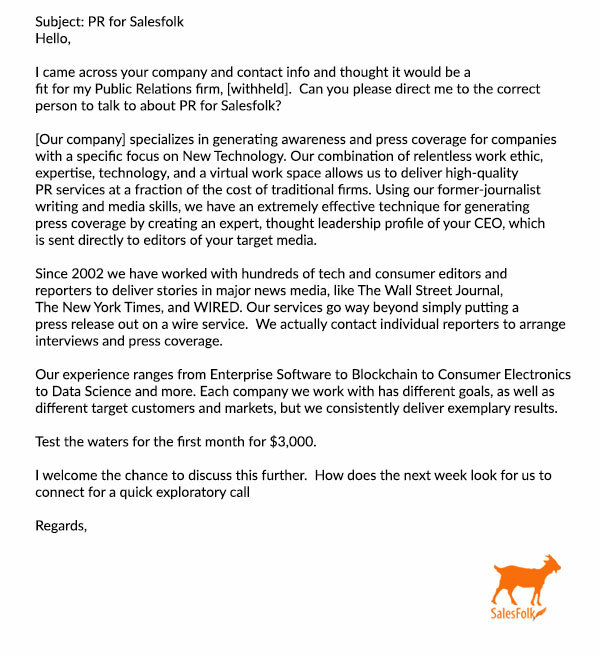 The sender doesn’t just accidentally include a long CTA or one too many questions. 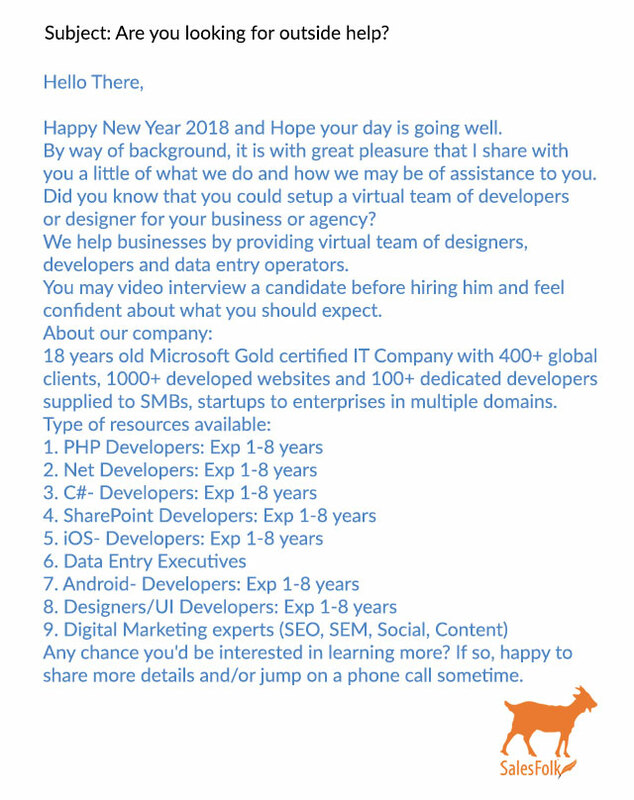 They expect the recipient to complete multiple steps in order to even get to the so-called benefit: read this job description; reply if they’re interested; reply if they’re not interested; submit names of other potential candidates. Long story short, the sender wants the recipient to do the work. They clearly haven’t properly researched relevant candidates, and instead, expect that and all other useful information to come from others. This is the sort of email that won’t just annoy people; it could outright offend them. This one reads like it was written at 5 p.m. on a Friday when the sender realized they were a few outbound emails short of their weekly requirement. 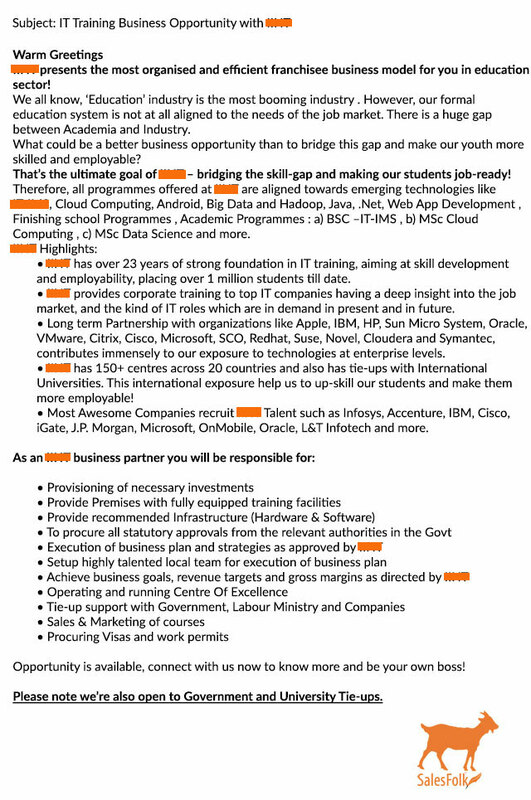 On top of that, the text is full of obvious typos and grammatical errors that add an extra layer of unprofessionalism. One glance at this message, and people will move on. This would be a relatively inoffensive message—if the sender had simply made it a marketing promotion instead of trying to convince me it’s a cold sales email. 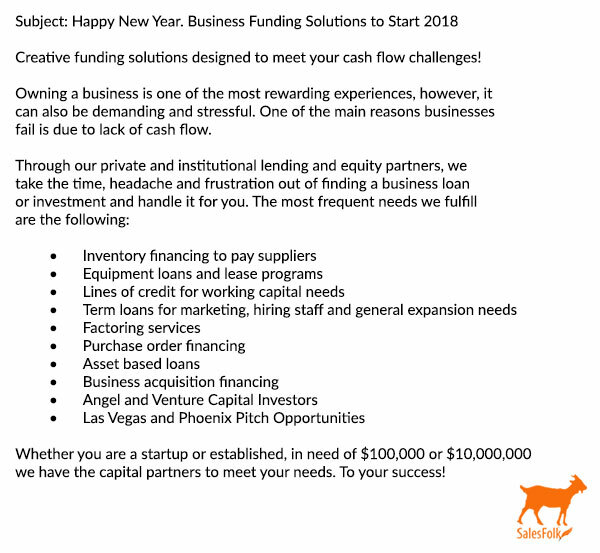 Besides covering way too much information for one email, this message completely lacks the kind of personal touches that make cold email successful. There are no benefits, just a gratuitous feature list. 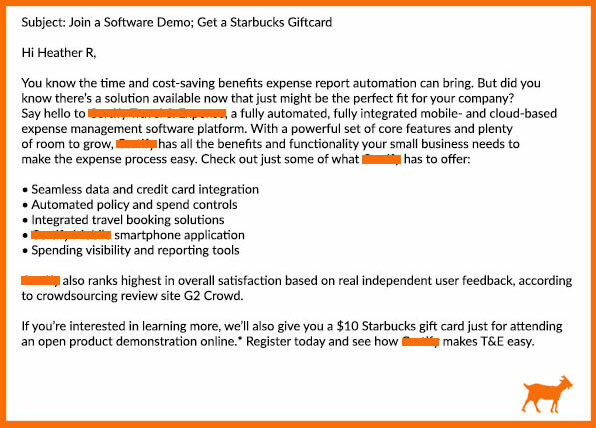 And using “Heather R” in the name field immediately gives away the game: I’m one of probably 1,000 names scraped out of a CRM and thrown into a marketing-automation tool. There is definitely a time and place for marketing promotions. 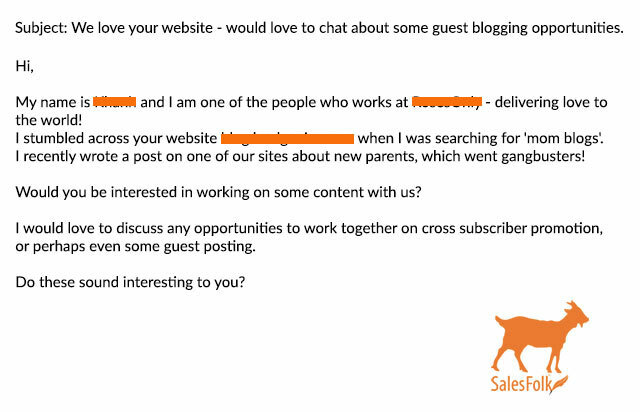 As part of a cold email campaign isn’t one of them. 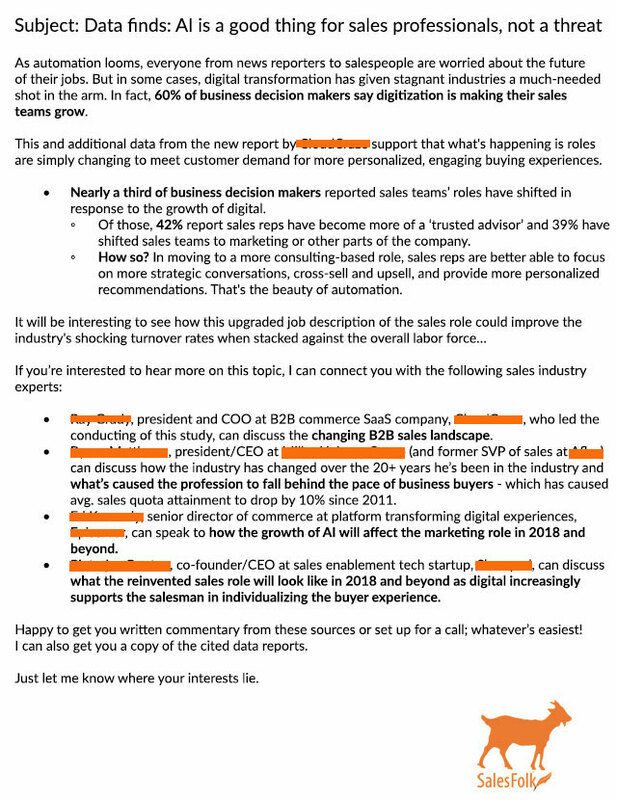 Pro tip: always clean up your CRM data before you send your messages. 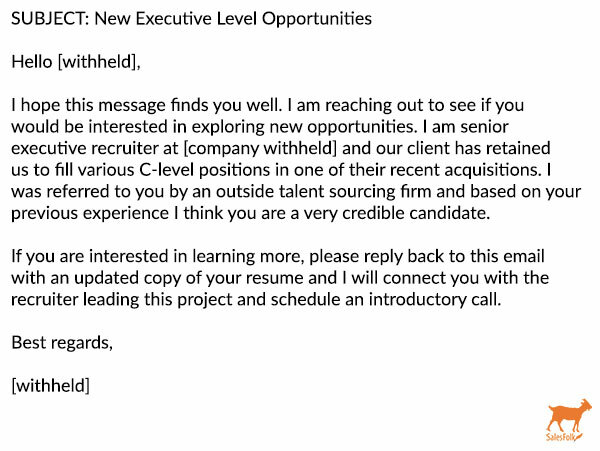 “CRM Specialist” definitely pops up on LinkedIn now and then as an actual job title—but that doesn’t mean we should go around using it with total strangers. 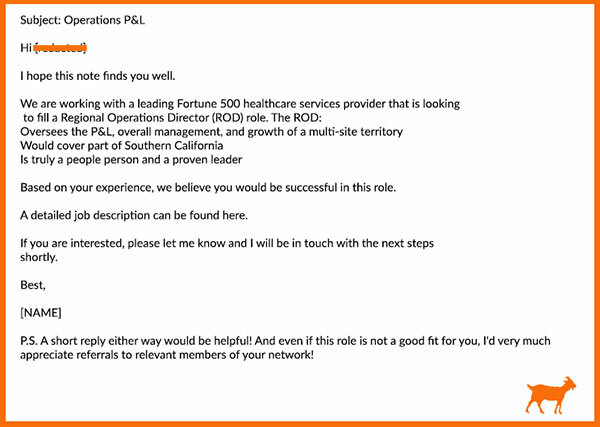 The phrase is business jargon at its finest: vague, pretentious, and not descriptive of any real job at a company. 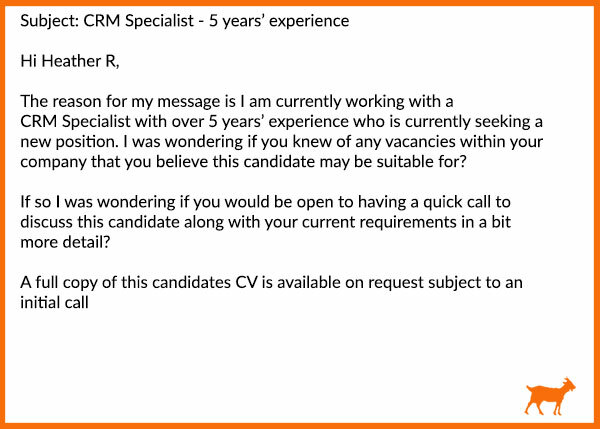 Presumably, anyone using a CRM in their day-to-day work is a kind of specialist. The rest of the message is just as vague. It doesn’t tell me why this mysterious candidate might be a good fit for my company or what skills they can bring to the ones I already employ. Finally, the text is messy, with bland, redundant wording and a couple of typos that should never wind up in any kind of email, cold or not. This person really, really wants to come off as one of those warm, bubbly types you just can’t help but reply to. But a salutation that reads “Hey!” just screams that the sender wants to appear chill when they are actually desperate for a response. 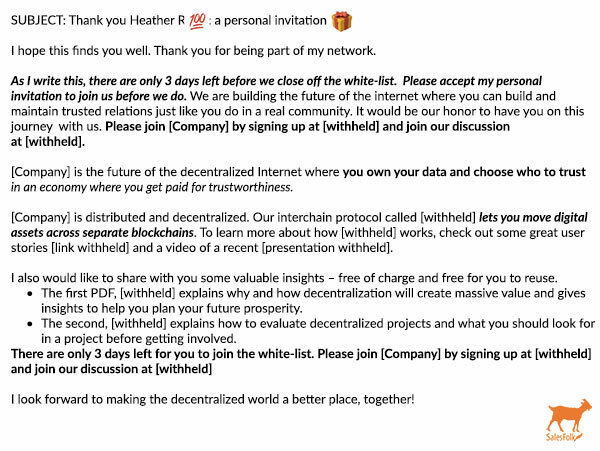 Then there are the multiple links to promotional materials, along with three different CTAs that aren’t so much about my taking action as they are about the sender wanting to seem cheerful. 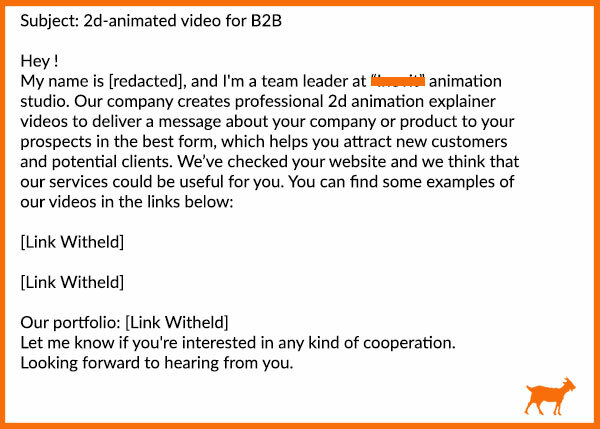 Had they spent more time cleaning up run-on sentences and outlining why I could benefit from animation videos, I might have been more interested in the product. 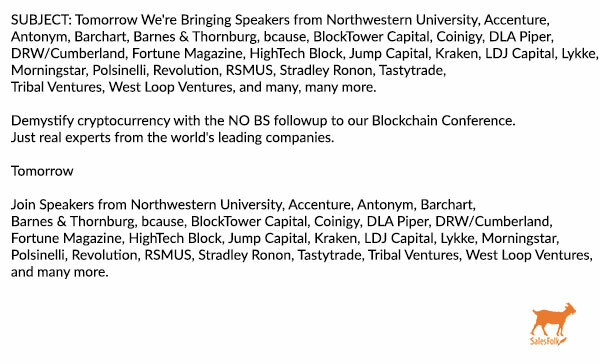 Seen any other cringeworthy cold email stereotypes that deserve a place in our Hall of Shame roundup? Send them to [email protected] for consideration. 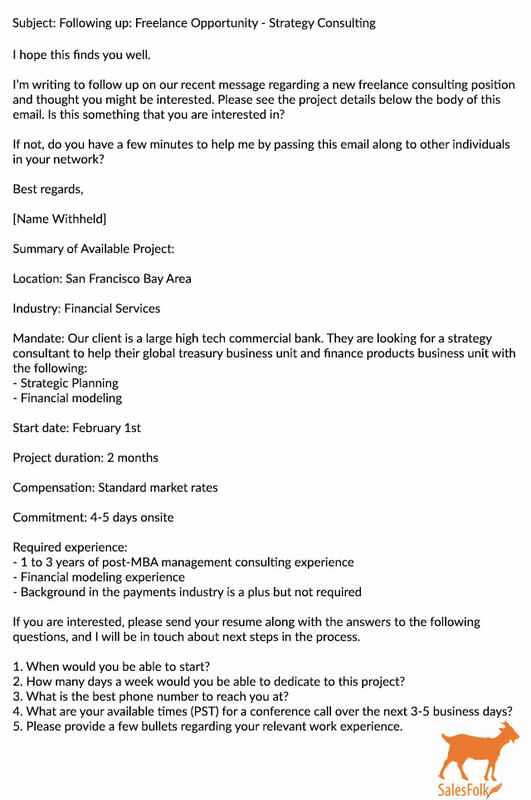 The weirder/wackier the cold email “personality” nominated, the better.